Finalists (L-R standing) Trent Harmon, Avalon Young, La'Porsha Renae, Gianna Isabella, Tristan McIntosh, Olivia Rox, Sonika Vaid, (L-R front) Lee Jean, Dalton Rapattoni and MacKenzie Bourg pose at the party for the finalists of "American Idol XV" in West Hollywood, California, Feb. 25, 2016. American Idol, which gave the world Kelly Clarkson, Carrie Underwood and Jennifer Hudson, has one more chance to mint a star before it fades into TV and music history. Whether viewers choose a future chart-topper or trivia question remains to be seen. But executive producer Nigel Lythgoe, who helped translate Britain's Pop Idol into the Fox version that debuted in 2002, said the farewell episode will be memorable. “It's going to be a rather spectacular show,'' Lythgoe promised, with all the former winners on hand along with past contestants and “other surprises'' in the two-hour finale. “It's about the American idols, about reminding people of 15 seasons,'' he said, as well as giving the final winner his or her share of the spotlight. The contenders for this year's title are Trent Harmon, 24, of Amory, Mississippi; La'Porsha Renae, 22, of McComb, Mississippi; and Dalton Rapattoni, 19, of Dallas. The two finalists are to be announced Wednesday night and the top vote-getter will be crowned on Thursday's finale, which airs at 8 p.m. EDT. Besides Clarkson and Underwood, other past winners set to perform on the finale include Ruben Studdard, Fantasia, Jordin Sparks and Scotty McCreery. Among the many other contestants taking part: Clay Aiken, Chris Daughtry, Katharine McPhee, Kellie Pickler, Elliott Yamin and LaToya London. Past Idol finales became known for flaunting superstars, perhaps none more important than Prince. His performance in the 2006 season-ender signaled that the show had transcended its image as overblown karaoke and become a respectable showcase for established artists. But Lythgoe downplays the importance of celebrities as part of the finale — or the contest itself. “It isn't about big stars coming on and singing their record. American Idol was never about that. It was about the young stars we created,'' he said. 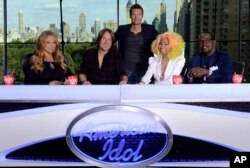 This photo provided by Fox, American Idol host Ryan Seacrest, center, poses with judges, from left, Mariah Carey, Keith Urban, Nicki Minaj and Randy Jackson, Sept. 16, 2012 in New York. Lythgoe can't avoid a bit of impish humor involving a certain pair of divas, former judges Mariah Carey and Nicki Minaj, who famously clashed during their shared 2013 tenure. “I've invited them back to the finale to sing ‘That's What Friends Are For,''' he said. Host Ryan Seacrest and judges Harry Connick Jr., Jennifer Lopez and Keith Urban — the final incarnation of the original panel with Simon Cowell, Paula Abdul and Randy Jackson — will help usher out the show. Season seven contestant David Hernandez already is feeling a sense of loss. “I only really associate great memories with being on that show,'' he said. While some others are reluctant to credit their careers to Idol, he gladly admits it — and so, he points out, does one of the show's biggest graduates. Carrie Underwood accepts the award for collaborative video of the year for Miranda Lambert's "Somethin' Bad" during the 2015 CMT Awards in Nashville, Tennessee, June 10, 2015. Idol was as much a boost for Fox as any of its young singers, ruling the TV ratings as the No. 1 series for an astounding nine consecutive years. Lythgoe said he was confident that British mega-producer Simon Fuller's Pop Idol format, with its unusual behind-the-scenes view of contestant auditions, would export well. And he told Fox executives just that. While Cowell's barbed criticism of contestants helped drive the show's popularity, it also made for a rocky start with Abdul, who favored a more nurturing approach with the show's young talent. Season six winner Sparks calls the show worthy of a grand send-off.